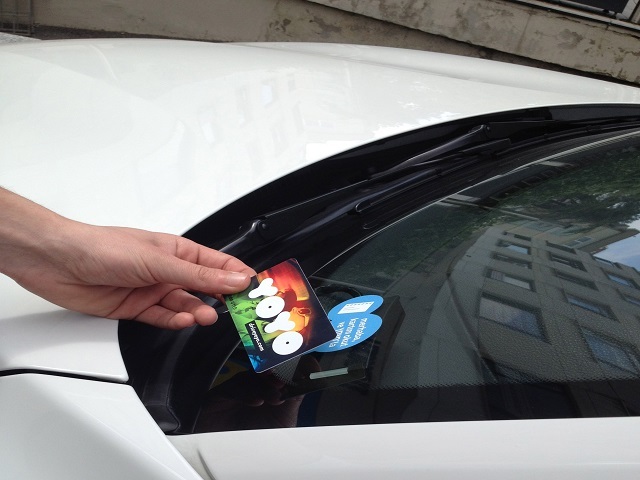 What is the future of carsharing? What impact will this innovation have on cities? What are the key challenges for ensuring that carsharing becomes a vehicle for sustainable mobility? This four-part series from TheCityFix draws on new research from WRI Ross Center for Sustainable Cities, exploring and unpacking what carsharing means for cities of the future. 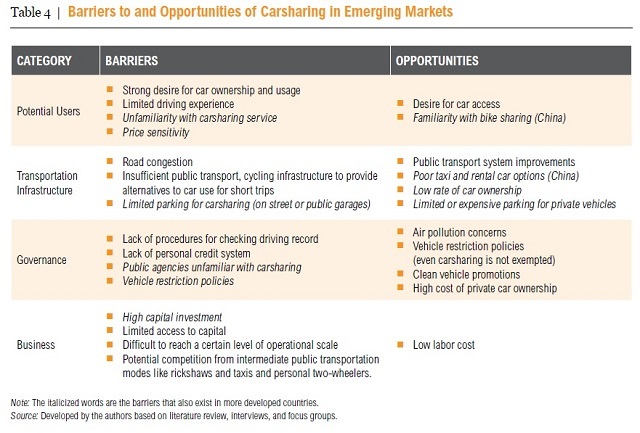 Like any emerging industry, carsharing is currently facing major barriers to growth in diverse, global markets. These barriers originate from four primary sources: (1) potential users, (2) transportation infrastructure, (3) government, and (4) business. While these four are common in cities worldwide, emerging markets pose unique challenges to carsharing, such as insufficient public transportation, private vehicle restriction, acute traffic congestion and competition from semi-formal transport modes. In response, many carsharing companies have adjusted their business models to fit the local context. For example, some carsharing operators (CSOs) have developed flexible return policies to accommodate users stuck in congestion, while others offer affordable five-hour packages to attract users making multiple trips. Drawing on each of the barriers, below are four of the largest challenges facing CSOs. One key question is whether carsharing encourages individuals to become car owners, or whether carsharing substitutes for car ownership. In our focus group, we found that participants hold strong aspirations for personal mobility—which is both an obstacle and opportunity for shared vehicles. While carsharing allows people to access cars without ownership, the majority of individuals still considered it a second best option and preferred owning over sharing. This is particularly true in developing countries like China and India, where cars are widely regarded as a status symbol. Indeed, within the focus group in Hangzhou, half of the non-car owning participants had plans to purchase a personal vehicle in the short term. Further, one third of all participants believed that owning a private vehicle reflected social status. So, while carsharing taps into the common desire to drive a vehicle, it may also fuel broader desires for vehicle ownership. With the number of global vehicles growing exponentially, many cities are experiencing major traffic congestion. Intuitively, this poses a problem for carsharing. With limited road infrastructure and public transport, developing countries are especially vulnerable to extreme congestion. According to TomTom’s annual traffic index, 13 of the top 20 worst cities to commute in are located in emerging economies, including China, Brazil, Turkey and Mexico. For carsharing, traffic congestion makes it difficult for CSOs to predict when users will return shared vehicles—a major challenge to fleet management. To mitigate this unreliability, CSOs in congested cities often plant multiple vehicles at a location, ensuring users always have options. In addition, CSOs in Brazil and China have given users flexibility with the return time. For example, Zazcar, a company in Brazil, gives users credits back for their unused hours. Moreover, the company only doubles the cost rate when users go over their allotted time—unlike Zipcar in the U.S., which charges late fees starting at $50. Due to congestion and air pollution caused by excessive private vehicle use, cities in China, Brazil, Mexico and other emerging economies have implemented vehicle ownership and/or usage restrictions. On one hand, this can help carsharing, since vehicle restrictions could make carsharing a more attractive option to a household’s first or second car. For example, during our research in Hangzhou, the city was implementing vehicle-travel control policies which kept one-fifth of all vehicles off the streets during peak hours. Although carsharing vehicles were not exempted, some residents used carsharing services to substitute during times when their private cars were restricted. On the other hand, vehicle restrictions pose a threat to carsharing, as few governments exempt CSOs from these policies. For example, at the time of our interview in 2012, YiDianzc—a CSO in China—had only been able to operate seven vehicles in two years because of Beijing’s restrictions on vehicle purchases. Because of this, many mobility experts and CSOs recommend that carsharing be exempt from private vehicle restrictions, since it serves as an alternative to personal vehicle ownership. As carsharing enters new markets, it often faces strong competition from similar transport modes, such as taxis and auto-rickshaws, which are usually affordable and accessible in developing countries. For example, participants in the Hangzhou focus group identified taxis and rental cars as major competitors—in Bangalore, individuals often compared carshare to auto-rickshaws. However, despite the competition, carsharing satisfies unique demands that its competitors can’t. More specifically, users tend to have a greater preference for carsharing when they need to make long or multiple trips. In response, CSOs have developed special pricing strategies to attract users making multiple trips in a short period of time. For example, Chefenxiang (EVnet) in Hangzhou offered a 5-hour package for only 45-60 yuan (about $7.40 to $9.80 USD) plus distance fees. In sum, carsharing is finding its own niche. Together, rapid motorization and urbanization create a dynamic context for carsharing, but also raise a lot of questions. For example, will shared vehicles be exempt from vehicle restrictions in China? Will cities continue to invest in public transit that complements carsharing? So far, carsharing has proven resilient at accommodating regional differences. However, scaling carsharing as a solution for sustainable shared mobility will require a policy environment that takes into account these four types of barriers.